The following few days we travelled north along the east coast, stopping at different campsites and cycling into local towns. The weather remained warm and sunny in the south east of Sicily but heavy rain was forecast for the north of the island and the mainland. We stayed with the good weather for as long as we could but eventually we ran out of time and ended up in rainy Messina on the north east corner of the island ready to catch the ferry back to Reggio di Calabria on the mainland. The ferry trip cost 55 euros and took just half an hour. We were soon driving north towards Salerno and by noon we decided to leave the motorway to find somewhere for lunch. We drove through a couple of small towns but they did not look like nice places to stop, they looked poor and there was a lot of rubbish bagged up, piled by the roadside. So we drove on, the road became narrower and began to climb steeply; there was no opportunity to stop and turn round, so we drove on . . . and on, up and up. The condition of the road was very poor in places, mud slides blocked the inside lane and in places the outside lane had collapsed down the hill. It was hazardous driving and low cloud obscured our view as we climbed higher and higher. We were driving through thick woods and there was hardly another vehicle on the road. Eventually the road levelled out and we came to pine forests with evidence of logging activities; everything was eerily deserted without even the sound of birdsong. A fallen tree blocked the road ahead and we were only able to get past by driving gingerly on the soft verge. After what seemed a long time, the road began to wind its way down again and we felt we were getting back to civilisation – we had been on that road for two hours. Then we saw a restaurant in the middle of nowhere, lights shining inside and cars parked outside. It was like a mirage in the desert! It was after 2 pm but several diners were still eating in front on a huge log fire. The food was wonderful, pasta with wild boar and mushrooms followefd by chops cooked over a wood fire with potatoes and vegetables. Coffee followed – the cost was 55 euros and worth every penny. It was not far back to the motorway and we were soon driving north again. The following morning we left the northern coast and headed inland towards Siracusa on the south east coast, a drive of four hours. The scenery driving south across the island was spectacular, the bright colours of spring assaulted our eyeballs with vivid green fields, yellow wild flowers thickly scattered along the roadside and almond trees in full blossom. Every available patch of the surrounding countryside was being cultivated, there were acres of citrus orchards and many small plots growing a variety of vegetables. The sun was shining and the temperature rose to eighteen degrees although snow was clearly visible on the distant mountains. 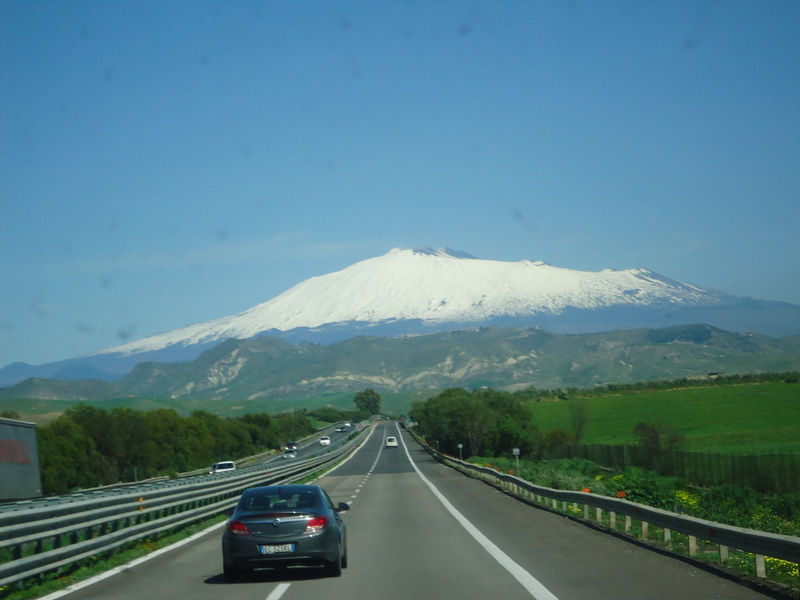 We drove past Mount Etna, almost 11,000 feet high, the largest volcano in Europe and one of the world’s largest active volcanos. 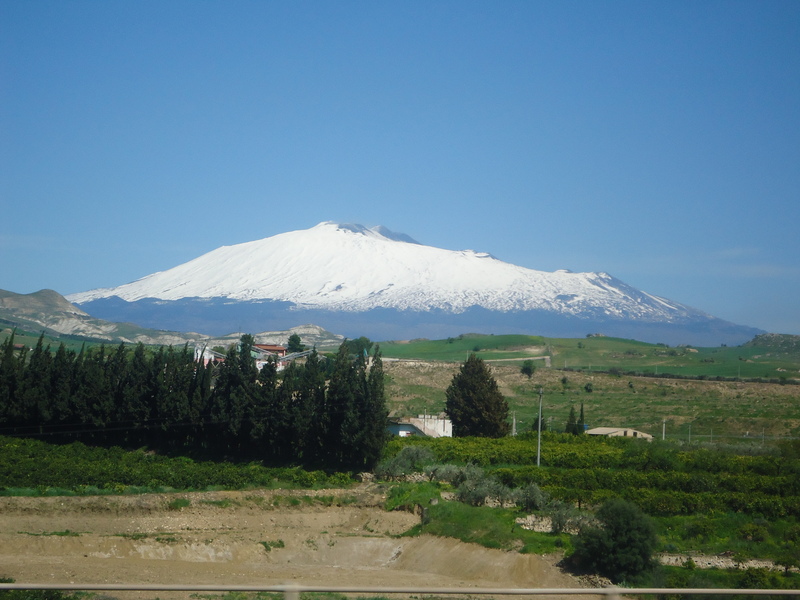 Etna had been in a continual state of eruption since 1998, the latest eruption being in 2002 when lava engulfed a village on its northern side. It looked quiet enough to us as we drove by, its snow covered peak appeared to be suspended in the air against the blue sky, its lower regions almost invisible in the distance. Once we reached the coastal plain the scenery became much less dramatic. 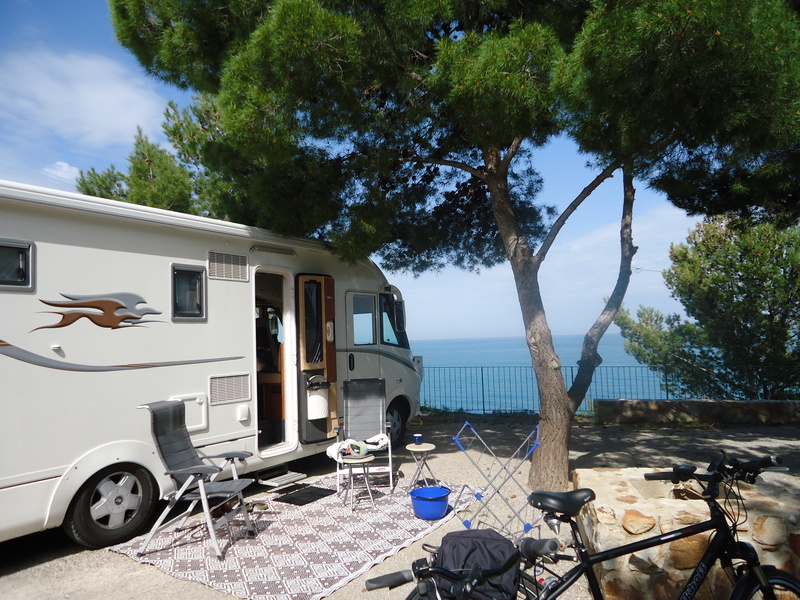 Our camp site near Avola was perfect, perched above a sandy beach on sunny terraces. The owners were pleasant and very welcoming. There was a restaurant close by but it was not due to open until 8 pm. We had breakfasted early and had not stopped for lunch so we did not want to wait that long. So it was pasta with home cooked garlicky tomato sauce. Whilst we were cooking we were visited by various cats, all looking healthy and well fed. 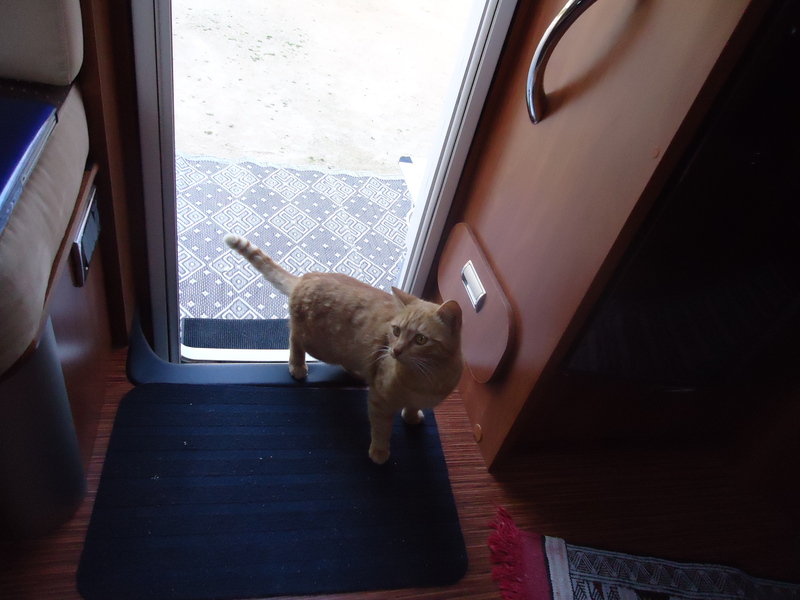 We had no meat cooking but a handsome ginger Tom hopped into the camper to see what was on offer to eat. There was a spot of pasta sauce spilled on the floor which he readily licked up – and then he promptly left. There may have been a bit too much chilli in it for feline tastes! Then it rained and it rained . . . and rained some more. We walked into town for Sunday lunch huddled under our umbrella. We usually avoid seafront restaurants in favour of more humble establishments a street or two away from the main thoroughfare but on this occasion the rain was so persistent that we took the first restaurant we came to. 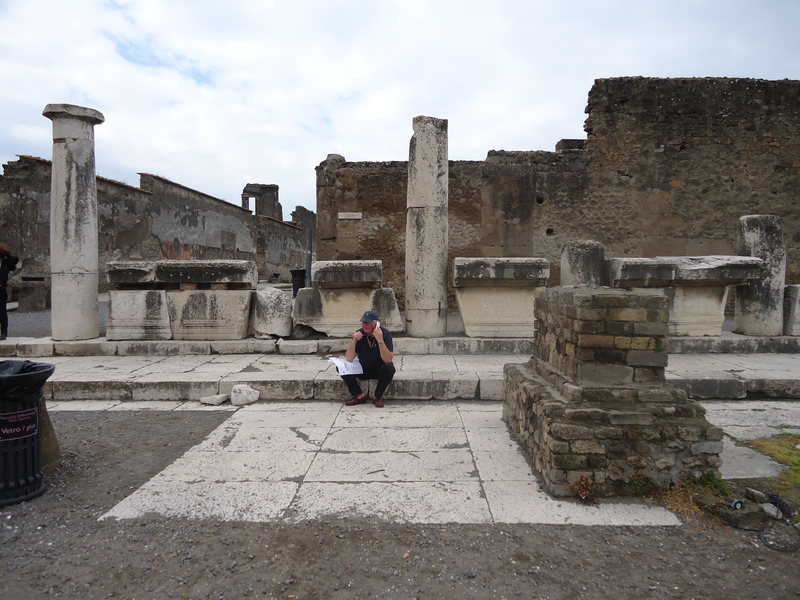 It was fairly empty but the staff did not appear to welcome our arrival. We paid too much for our (excellent) plate of pasta and coffee but at least we were sheltered from the rain for an hour or so. We were the last to leave the restaurant, having bravely ignored the glares of the staff for as long as we dared. The following day we headed for Genova and the ferry to Sicily. The ferry left at ten in the evening and took 22 hours. The seas were rough and our cabin was high up at the front of the ship. We had a disturbed night’s sleep with lots of crashing and banging. After one particularly big crash, the ship slowed down and conditions became easier. The following morning the weather was warm and sunny. There was a self service cafeteria serving breakfast but we wanted to eat later, say at 4 pm before the ship docked at 7 pm. Bizarrely the restaurant only opened for lunch between 12 and 1.30. We were not surprised that the restaurant was virtually empty . . . the food was not particularly good and was expensive. We also found the crew unhelpful, although this could have been due to a language problem as we were often mistaken for Germans. We docked at Palermo at seven in the evening but it was more than an hour later before we were able to disembark. By then it was dark and the city was heaving with traffic, coming from all directions with horns blaring constantly. Traffic was gridlocked and we failed to locate the local campervan parking area for our first over night stop. We drove on for an hour looking for another campsite but we were getting tired and reluctantly decided to spend the night at the roadside. 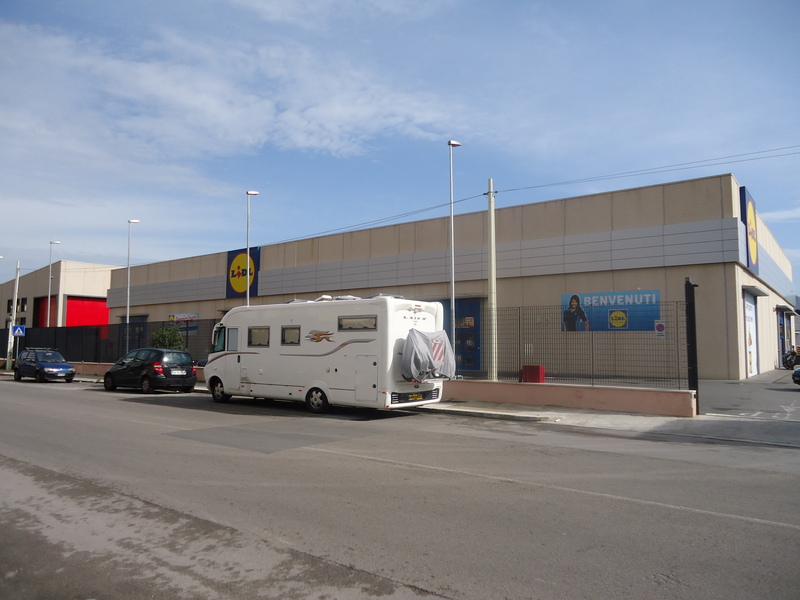 We found a good spot on a wide, well lit road right outside LIDL’s. We had a peaceful night and were able to shop for a few essential supplies in the morning. We drove east along the northern coast to Camping Rais Gerbi at Finale di Pollina. We had a beautiful pitch overlooking the sea and it was warm and sunny. The owner came by after we had settled and welcomed us to his site, it was so good to meet, at last, a really charming variety of the Italian species! We were on the road early the next morning, travelling south past Lake Lucerne and on through the Gotthard Tunnel towards Italy. The tunnel opened in 1980 and only had one lane operating in each direction. It was over ten miles long and seemed very narrow and claustrophobic. Traffic travelling in the opposite direction seemed just inches away from us and we were very glad to get out at the other end and back onto the dual carriageway. 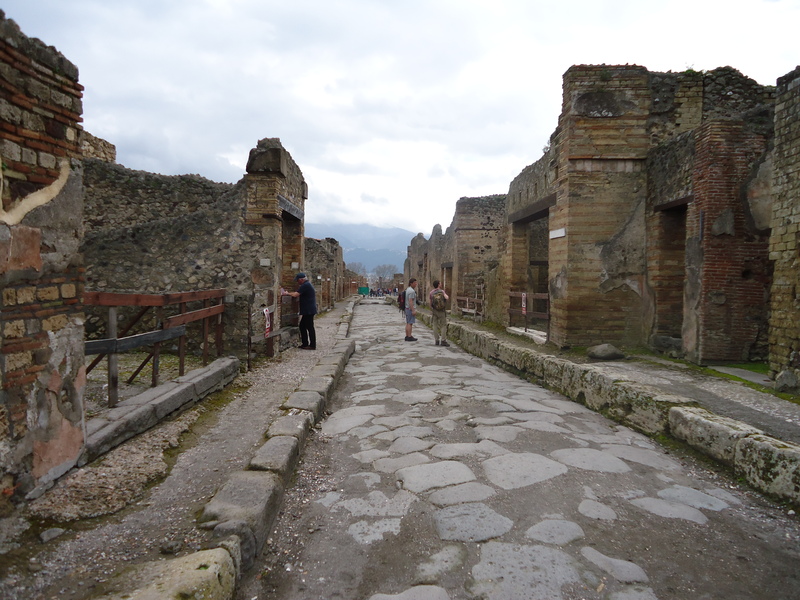 Once we crossed into Italy we found we had to pay toll charges for the first time since we left home. Our first day’s driving in Italy cost us 16 euros. We stopped for lunch at Lake Como (pasta and salad, beer and coffee – 16 euros) and bought some lovely fresh produce from a stall in the car park – the fruit cost more than our lunch! We found a campsite at Rapallo, a coastal town near Portofino. The weather was getting warmer as we descended from the mountains, now the snow was all gone and we enjoyed blue skies and temperatures of 15 degrees – balmy by our standards. The next day we made the most of the sunshine and headed off to explore Rapallo on our bikes. 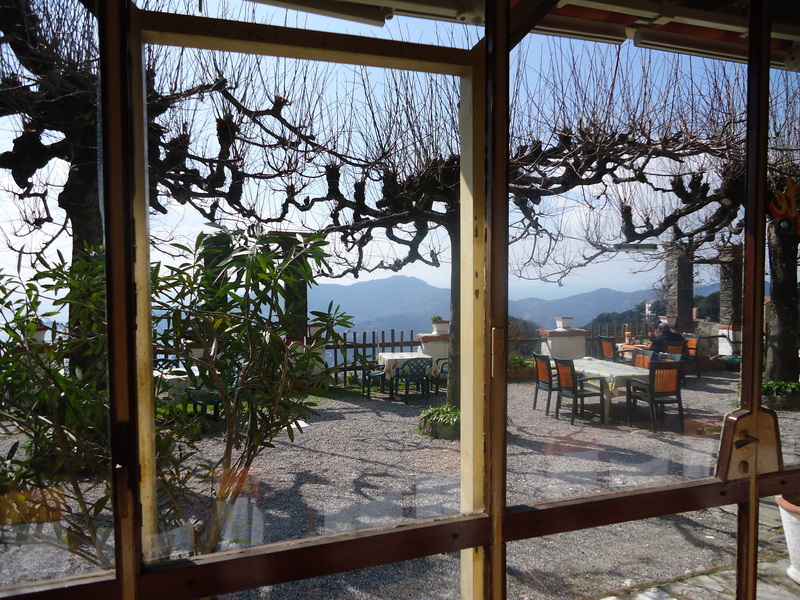 We took a cable car up the mountain to the Sanctuary of Montallegro where we found a restaurant for lunch of seafood salad followed by spaghetti with clams, washed down with a carafe of white wine and coffee (75 euros). 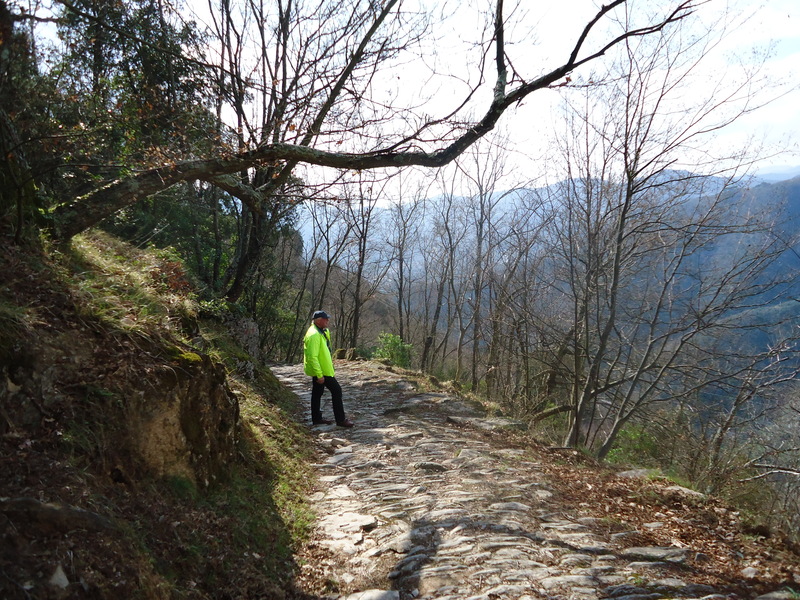 We had the choice of returning by cable car or walking down the winding cobbled path. We chose to walk – they said it would only take an hour. Almost two hours later we arrived back at our bikes, having begged a lift for the last kilometre of road from a passing motorist; we were exhausted! There was an unexpected blanket of March snow covering the garden on the morning of our departure, not an auspicious start to our Sunny Italy Trip. We encountered several mini snowstorms on our drive to Folkestone but arrived safely before dark. Overnight the weather worsened and there was chaos on the roads the following morning. We were booked on to the 8.30 am train so we left the Collinsons soon after 7 am to travel the few miles to Eurotunnel. We found all the main roads blocked with cars and lorries abandoned overnight in the snow and the minor roads were impassable due to snow and ice. There was also heavy snow in northern France and the French were refusing to accept any freight lorries from the UK so the M20 was soon gridlocked with hundreds of parked lorries waiting to cross the Channel. It took us four hours to cover the three miles to Eurotunnel. 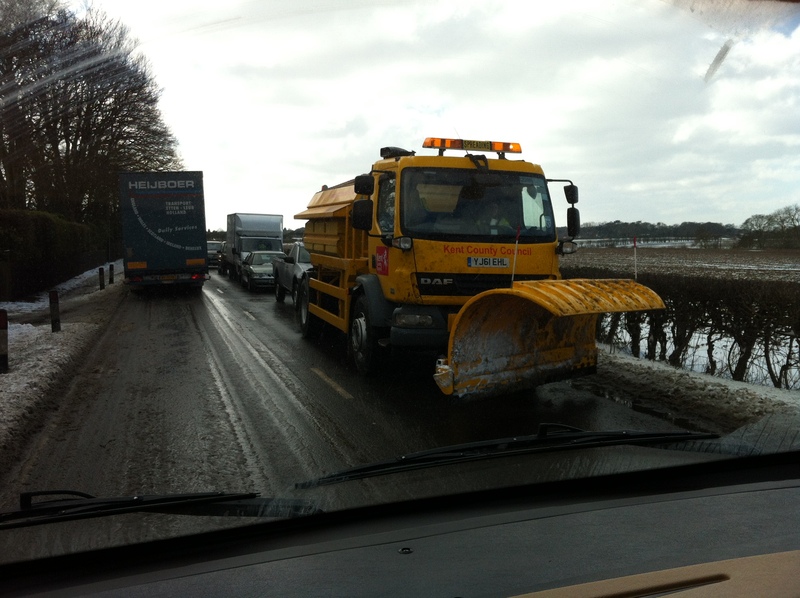 Even the snow ploughs could not get through gridlocked traffic. We eventually arrived in France several hours later, the weather was perfect, dry and sunny – but very cold. We drove through France and on into Belgium. We were getting tired and were thinking of looking for a campsite when we stopped for fuel. The cashier at the service station explained that we could stay overnight on their car park. We found a nice spot at the back, overlooking fields and joined a collection of overnighters, mostly lorry drivers. We had a meal in the restaurant, it was typical motorway food and had been kept hot for far too long – but we were hungry. The following morning we were on the road early, heading for the Netherlands where VB Air Suspension at Varsseveld were due to carry out modifications to our air suspension system. This work was carried out whilst we spent a few hours having lunch in the local restaurant and then we were ready to set off for Germany. 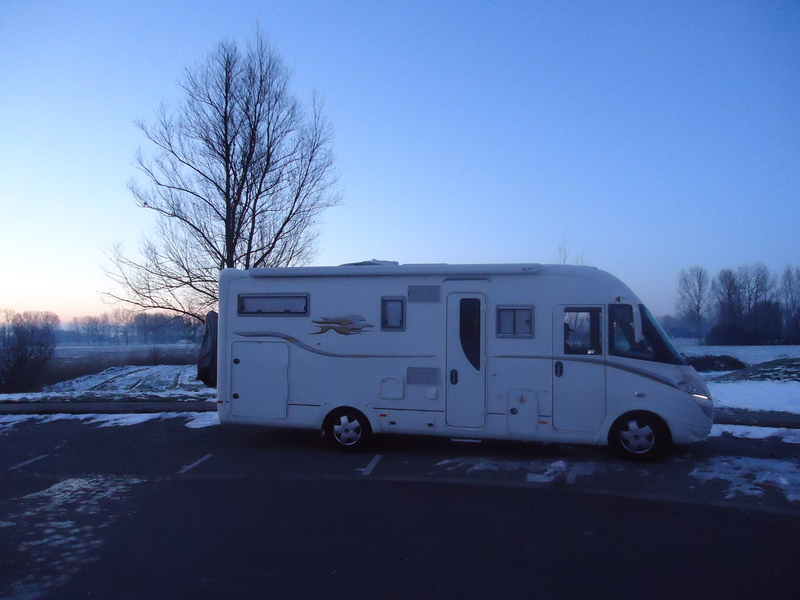 We spent that night at a campsite near Cologne and were on the road early the next morning. We drove all morning and then stopped for lunch and a rest. A few more hours’ driving brought us to Switzerland (our 6th country in three days) where we found a pleasant campsite at Solothurn, just south of Basel. The weather was still very cold, with snow blowing in the air, even though the winter sun was shining.